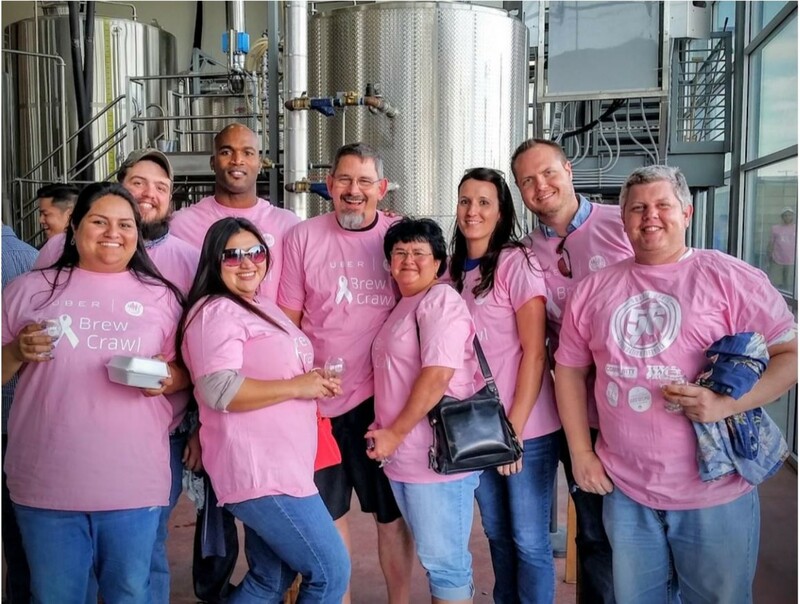 Improving teamed up with The Dallas Brew Scene and Uber in the inaugural Brew Crawl for Breast Cancer program on Saturday, October 17, 2015. All proceeds for this event go directly to the Bradie James’ Foundation 56, a breast cancer outreach program assisting those affected by breast cancer. The foundation works with those affected to receive the services and access to the resources they need. Improvers Barry Forrest, Nik Clarkson, Tim Burga and Kris McGinnes represented the Dallas Improving office in this charity event. They were provided pink t-shirts and chauffeured by Uber while sampling beer from five of Dallas’ finest breweries – Community Beer, Texas Ale Project, Deep Ellum Brewing, Four Corners Brewing, and Noble Rey Brewing. The event received glowing remarks from all participants and they look forward to this becoming an annual event.